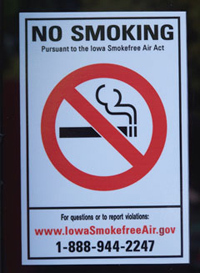 Sign required by law in bars under the Smokefree Air Act. The lawyer for the bar owner at the center of the smoking ban lawsuit says they will decide sometime next week whether to appeal the Des Moines County ruling upholding the ban. Darwin Bunger represents Larry Duncan, who sued after his liquor license for Otis Campbell’s Bar and Grill in West Burlington was suspended for violating the smoking ban. The lawsuit in part claimed the exemption to the law for state-licensed casinos was unconstitutional. Bunger told Radio Iowa one of the key points he sees in the ruling is the judge said the state has a right to allow smoking in casinos because of the money the casinos bring the state. Bunger says it doesn’t seem the need for money by the state is a good reason to allow one group something while denying another group. “No matter how we lawyers, whether we’re judges or practicing law, try to…spin it, it doesn’t come of sounding well at all. It just doesn’t. For that, the need for the state to have that money, to be the basis for saying unequal protection is okay, just grinds on a citizen I would think,” Bunger says. The judge also ruled the Iowa Alcoholic Beverages Division could enforce the smoking ban under its jurisdiction over liquor sales. Bunger says they still feel the I.AB.D. does not have the jurisdiction. Bunger says they have always believed there wouldn’t be any case against the bar, but for the Smokefree Air Act, and he says some might think that is a technicality, but he says it is not. Bunger says Duncan will make a decision after the holiday. He says he has talked to Duncan and given him the options to think about. He says it has not been a pleasant time for Duncan. The administrator of the Iowa Alcoholic Beverages Division, Lynn Walding, put a stay on the revocation of Otis Campbell’s liquor license until the case was decided, as long as the bar did not allow smoking. Walding says the bar has complied with the law during the legal process.